Rural fencing from Quikfence is a durable and long lasting fencing system that is quick and easy to install. The fencing is designed for containment and protection, to withstand a variety of situations and environments. defining private property and boundaries. This rural fencing system is durable and can withstand storms, as well as being knocked or rammed by large animals, without being damaged. The rural fences are available with a range of gates, suitable for various applications such as ease of opening and closing the fences when herding animals, or keeping unwanted guests out of wide open fields. Fence gate options include operation by solar or electric gate openers. Rural fences from Quikfence are designed to last for a lifetime as well as being quick and easy to install. 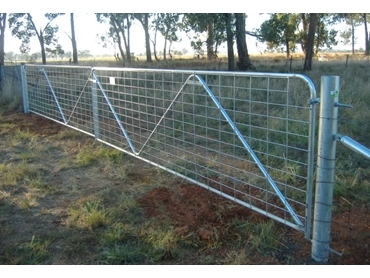 When supplied by Warwick Gates Pty Ltd, all the tools and machinery to install the fence will also be provided. Contact Quikfence to find out more information about installation options and to find the closest expert fencing dealer.